Mr.Kipiani kindly agreed to give a short statement for the tournament website. 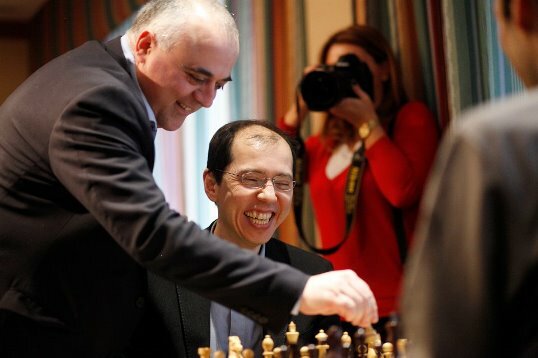 Q: Mr.Kipiani, you are visiting the playing venue of the FIDE Grand Prix here in Tbilisi. What are your impressions? Minister Levan Kipiani: First of all I would like to thank the President of FIDE, our friend Mr.Kirsan Ilyumzhinov, for the opportunity to host such an important event in Georgia. We have a long-term project and programme to develop chess. As you know chess is very important sport and we are preparing to host the 2018 Chess Olympiad in Batumi. For me it is a great pleasure to meet these famous chess players and I hope that they will show motivation, quality play, and I hope our own Baadur Jobava will also show his potential. As I said, chess is very important, our Government and our Ministry are providing full support for the future organization of the youth championships, European championships, and events like Grand Prix. 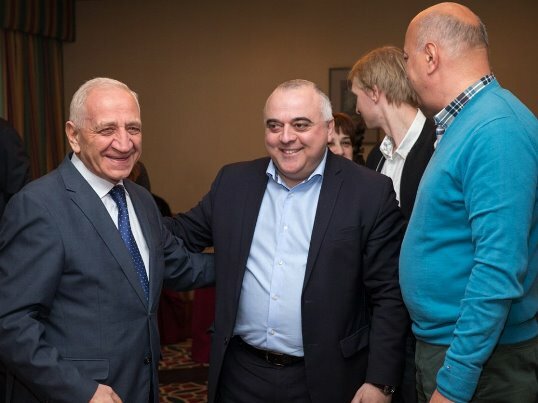 We have a very good cooperation with the International Chess Federation (FIDE) and I would also like to thank the Chess Federation of Georgia for successfully organizing such big events in Georgia. Q: Some time ago it was announced that your Ministry has increased the budget for chess. How do you plan to use these funds? A: It is very important that we have a long-term four-year plan for chess, with a budget approved by the Government. Our main aim is to involve more children. We have a chess academy with Mr.Zurab Azmaiparashvili as its head, and he is fully involved in the process of developing the teaching programme. We have many talented children, girls and boys. Also for us is very important to use the momentum of this period when our women have great results, to organize more tournaments, like youth championship last year, this year we will have the women championship, and we also have more events scheduled in the coming years. I think chess has a bright future in Georgia.